Terrier Spirit; Part Four – The Dogs B*ll*cks!! Welcome to the latest article in the series by guest author Mark Rennolds. If you missed the previous articles and tactical downloads then read along here if you wish. At the end of the last article, we had just hit the New Year period in our first season and against all odds were sitting top of the Premier League despite the clubs meagre transfer and wage budget compared to the other clubs. Thanks to the shrewd transfer market dealings of DOF Guido Merry and the tactical tinkering (hello Mr Ranieri) of Sdlonner Kram, it has been a great season so far. I tinkered with the tactic a little more, especially the set pieces analysing any goals conceded, tailoring both attacking and defending set pieces which appear to be a big part of the game this year so far. I’ll do a quick summary of the changes later in the article with downloads, and a breakdown of the set pieces successes and positions for you guys playing on FM Touch. The title race went right down to the wire, with Liverpool and Spurs both able to overtake us with a few games to go. Our penultimate game was a real six-pointer against Spurs which we lost 2-1 after going down to ten men early on. So, on to the last game against Watford who were rooted to the bottom of the table. Our only hope was to bring in a good result and hope that Spurs either drew or lost against Man Utd. Our goal difference was better so it was still a hope. Rashford did the business after one minute and set them on their way so it was back in our hands. We didn’t fail to deliver with a dominant performance to bring the title home at the first time of asking. #TerrierSpirit#TheDogsBllcks. Highest Goal Scorers – goal threat spread equally across the more attacking players, with goals coming from layered attacks. 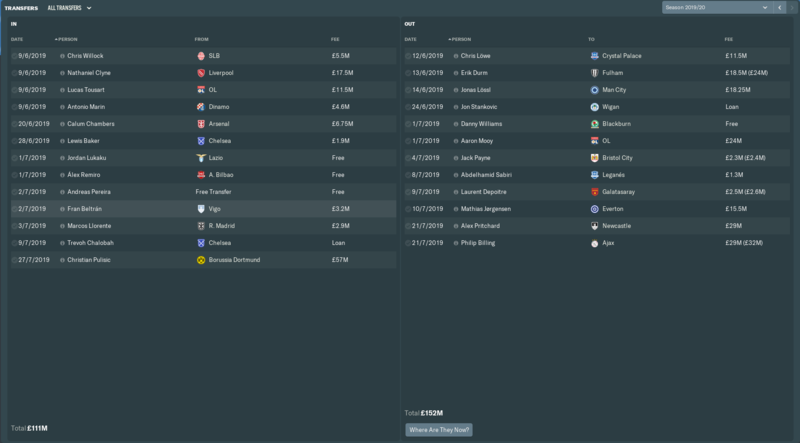 Shrewd Transfer Dealings – £16 million net loss on transfers but brought in some talented youngsters whose stock will rise massively over the next few years. As I said earlier I tweaked the tactic a little over the second half of the season to tighten things up at the back and make us more dangerous on the break. Added Prevent GK Short Distribution – I wanted the striker, AM and 2 wide players to prevent the easy pass where possible to encourage quick turnovers in midfield. Removed Get Stuck In Instruction – this was on most players individual instructions so removed it so players I wanted to stand off didn’t commit unnecessarily. Full Backs – added close down less and mark tighter instruction. Guido has done 2 great articles on positioning on set pieces, but I thought I’d share some of the goals I’d scored and images of the positioning I am using. Corners, in particular, have been a great success for me & I’ve not conceded a goal from a corner in a while after tweaking the defensive positioning as well. I thought I’d upload some goals to show you the lines that Guido has talked about in his articles. As it shows it’s the movement across the 6-yard line is key and where most goals are scored / conceded and where the ball needs delivering to. The key agenda for Season 2 was to strengthen the squad overall and have cover for each position as we will competing in the Champions League, so Guido’s dealings in the transfer market would be key. As you can see some profitable dealings where made and some key loan signings again. Going forward we are investing heavily in the clubs youth facilities, recruitment etc so we can be very self-sufficient & not have to buy players where possible. However, at this stage of the business plan, Guido has decided to bring in high potential young players as long as the fee is right. We now have 11 players aged 22 or under challenging for the first team positions with 4 being classified as ‘Wonderkids’. That’s it for now on this part of the series. In this next part of the series Guido will discuss his season 2 signings & I will discuss the season overall & how to cope with squad management for a European campaign with a low budget. In real life the likes of Burnley & Leicester have struggled with this, with either their Premier League or European season suffering. This is very similar to TFF tactic in SI forum. His tactics are normally very strong so if you are coming to similar conclusions then it has to be solid tactic. Yes there’s lots of similar tactics out there as there’s only so many permutations I suppose. Trying to get the 4-2-3-1 going for me at the minute. Did you give the tactic a go, interested to see how it performs with other teams? It did work really well as does the TTF version. It is an interesting set up. Achieved promotion from Championship with Sunderland using it having got out of League one with my own tactic. Love looking at other tactical systems though. My preference is to have a system that has different pressing styles though so that I can adapt to different situations. Currently using a strikerless 41410 with very high press and a deep 4420 with a middle and low press option. Working well with Sporting where I have moved following the success at Sunderland. Always play a journeyman save through the year and see where it takes me. Never start another one! Are you still using it or have you made the changes?